The one bonus to working downtown is the route I come into work. As you all know, the bus is my main form of transportation. I come into the downtown area and I walk...I'm early and I have plenty of time to wander and explore. AND before you ask...wnadering the streets so early in the morning is more than safe in San Antonio. There are so many security guards getting off duty for the night you never need worry. Besdies, Texas is the land of people carrying their own guns....totally safe. Even though we are the 7th largest city in the US we really have a small town feel when it comes to the people. Enough said!!! Back to the thought at hand. 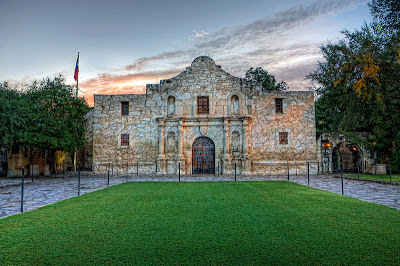 As I walk in to work I end up passing the Alamo every single workday I come in. As I walk along the Alamo walls I run my fingers across the lichen covered walls. 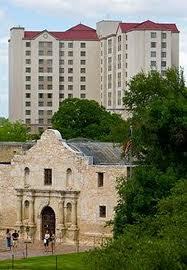 I will never forget the phrase: "Remember the Alamo!" That battle cry passes through my mind whenever I go into work. No, my job is nothing like a battle. I will admit this much. 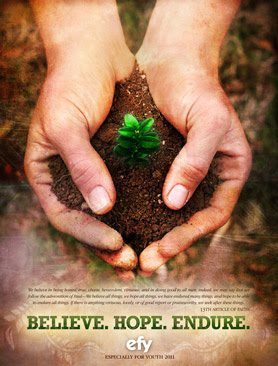 However, I remember to do my best in whatever situation I might find myself. Not with guns, but a smile and kindness do I use for my battles. All in all it is a good thing in rememberance of the valiant men who lined the broders of an American Icon. Seriously, my commute is amazing compared to what I used to deal with. When I am off work...I walk to my bus stop, I get to the transit center and my next bus is almost there. Then the long walk home. My kids? Oh they're off having fun at EFY and I am thrilled they get some downtime away from the computer, away from Mom & Dad but still in a structured environment. New job? Loving it!!! I am completely enjoying what I do and loving the fact that I can transfer all reservations calls to the Res Center I came from. Oh yeah!!! Life is good!!! I've got a plan and I am looking forward to learning even more. Best of all....I see Heavenly Father's plan unfolding....and I am grateful!!!! Tomorrow is going to be a different sort of day....to be sure. I start my new position tomorrow at the front Desk of the Residence Inn. It should be interesting, and FUN. Oh yeah, Fun to learn something new, to get to know new people and have new faces to greet every single day. It sounds like I'm joining a wonderful crew as everyone I spoke to in my office sung praises to the people I am being blessed to work with. So, at 4am I will wake and shower, prepare my lunch and then head off on the bus for my first short commute. No more 3 1/2 hour commutes each way...it's now 1 1/2 hours total. SWEET!!! Tonight, however, I will say good night to all three of my kids for the last time until Saturday. Tomorrow after I am at work and starting my new leraning process, Hubby will embark on his own adventure to take all three kids and drop them off at EFY. Tomorrow night when I come home the house will be empty and I won't have to worry about cooking dinner for everyone, cleaning up after anyone, except Hubby. I am frightened by the concept of not having all of them around. I'll enjoy a bit more of the quiet and not having to hear any of them saying: "Can I go on Facebook?" Tomorrow, will be a bittersweet day....good thing Hubby is taking me to the movies, to take my mind off it all, because at some point I'm going to have to exhale. Yes...I've been on hiatus for awhile. My mind has gone 5 bajillion miles a inute and it seemed as if my life had been rushing right past my head at incredible speeds. It has finally slowed a bit and changes have been made in my life.....hopefully for the better. First and formeost my biggest change has been my workplace. I am still within the Marriott system, but have interviewed....another 5 bajillion times....for various positions in hopes of disconnecting myself from the computer. I know, I know.....it's not a bad job. I also know many of you love to chat on the phone. However, when you are paid to talk on the phone for 8 hours a day with barely a chance to take a sip of water in between your incoming calls...it can become fairly tedious. So, I've applied and was accepted to transfer into a front desk position at the beautiful Residence Inn Downtown Alamo Plaza. Yes, I will walk past the Alamo twice as I walk to and from work. Yes, I will still put a pleasant smile on my face as I greet each of the guests and provide information as well as directions to various areas of San Antonio. However, my commute to and from work has also shrunk considerably. Instead of 3 1/2 each way on the bus to work, I will commute 1 1/2 hours each way to and from work. Much better!!!! This alone will save my sanity. Not only that I will be able to finally learn different haspects of the hotel industry that I've not had a chance to learn up till now. That is a wonderful bonus!! My hours will change considerably. For example. All the week I am working 7-3pm. Instead of the crazy hours I've worked in the past there are truly only a couple hsifts I will deal with. Everyone takes turns working the later shift from 3-11pm. We all rotate through and take our chances. For the most part we work 7-3pm...as that is the busiest portion of the day. Saying good-bye was difficult yesterday as chances are I will enver work with the poeple I've gotten to know so well. I became a bit tearful as I walked into work finding a banner above the normal desk I sit, wishing me well. At lunchtime I was surprised as a cake was brought out that my teammates had donated money to buy. And it was delicious!!! By the time I left I was nearly in tears as everyone and I mean everyone was hugging me and wishing me well. Our HR director stopped by to tell me how excited she is for me new position because she knows I will do fabulously well there. Every manager stopped by to wish me well and give me encouragemnt. I was so thankful. I was excited as ever as each of them gave me glowing reports of the management and the team I will be working with. I see the Lord's hand in all of this. At times in these many interviews I've wondered if I was getting any help from above as I pleaded in preayer for help with the interview process....always without an answer. I was needing to be patient and wait until this time to work with this team to work these hours. This is what makes me most emotional. To think with every other problem on this earth, my employment and happiness meant something to Heavenly Father. I've found the four hardest words to utter in my life are: "I know I matter."